I’ve always loved making and eating poke cake, but had never tried a crock pot cake before. I kept seeing slow cooker cakes all over the place, so I decided to try one myself. The closest thing I’d tried was this apple cobbler for the crock pot, which also uses a box of cake mix. While I still prefer the traditional method of baking a poke cake in the oven, this crock pot poke cake is a great alternative. Especially if you’re going to be busy all day or if you’ll be using your oven for other things. 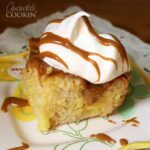 Crock pot cake is a great alternative! This crock pot cake is also a poke cake, so I couldn’t resist trying it. Making cake in the crock pot is easy and this one is delicious! It’s as simple as mixing up the cake mix according to the box directions, then pouring into the prepared crock. It will cook for a couple of hours, then you’ll use a wooden spoon’s handle to poke some holes. Mix up the pudding and pour it immediately over the holes so it doesn’t have time to firm up until after it’s in the holes. Next spread some of the Dulce de Leche over the cake, then thin some with cream to drizzle over the whipped cream you will dollop on top! At the risk of sounding cliche, it’s delicious! I am always willing to try different poke cakes. Do you have a favorite poke cake or crock pot cake? Grease or spray crock of the slow cooker well. Prepare cake batter according to box directions. Pour prepared batter into slow cooker. Cover slow cooker and set on HIGH. Cook for 2 to 3 hours, checking after 2 hours for doneness. Remove crock from slow cooker and place on a cooling rack. Use the handle end of a wooden spoon to poke holes all over the cake, about an inch apart. Whisk together pudding mix and cold milk. Pour pudding immediately over the cake (while it's still thin and hasn't had a chance to set) getting the pudding into each of the holes. Spread HALF of the can of Dulce de Leche over the pudding (you can warm it in the microwave to make it easier to spread). Place crock in the refrigerator for 1-2 hours. Transfer remaining HALF of the can of Dulce de Leche to a medium bowl. Dulce de Leche is pretty thick so microwave it for 15-30 seconds to loosen it up. Add one tablespoon of the cream and stir. Continue thinning the Dulce de Leche with cream until it reaches a drizzling consistency. When ready to serve, remove crock from refrigerator and cut cake into squares. 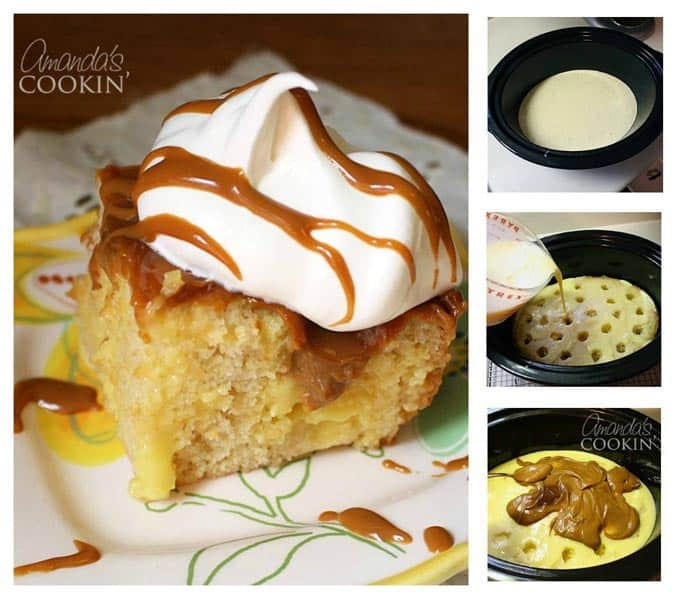 Top each piece with Cool Whip and drizzle with thinned Dulce de Leche. Did anyone try this and how did it come out? I’m making it for tonight for the Inlaws for dessert. So I serve the cake out of the fridge? Cold? I think I just found dessert for tonight! Thank you! Oh, gosh… This seems SO good it has to be illegal!!! I suppose you used instant pudding?